Countless spiritual texts explain that there are just 2 main states of being – FEAR or LOVE. I think that the essence of a spiritual practice (not to mention the way be happy and free) really boils down to switching to a state of love whenever we notice that we’re operating from fear. We can’t be in both states at once. So many of our thoughts tend to be based in fear. Especially the thoughts that pop into our head when we’re operating from an unconscious, “autopilot” state. Thoughts of worry are an example of being in fear. Judging, blaming or criticising others also comes from fearful thinking. Fearful thinking is never present or the truthful, but the stories we tell ourselves are so convincing! Can you think of a recent scenario of one of those “stories” you’ve had playing in your head? I know I don’t have to think hard to recall some! The key is in becoming aware of the fear-based thinking, and willing to switch. 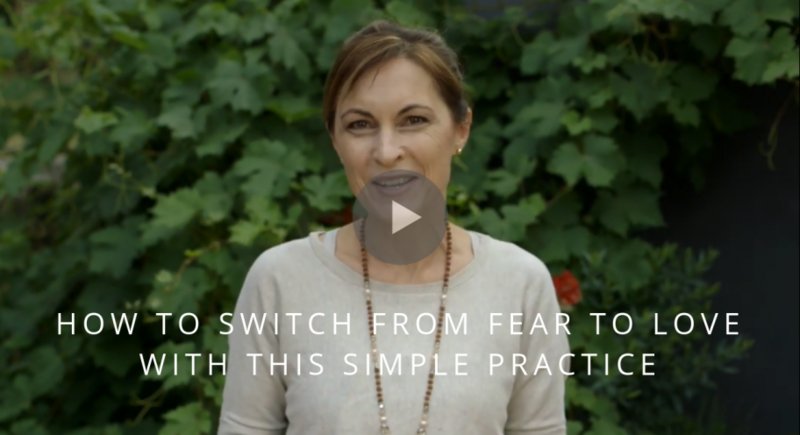 So how can we switch from fear to love? Here’s a simple but powerful practice. It’s all about coming back to the PEACE and TRUTH of the present. That’s where love lives! Once we notice that we’re caught in fearful thoughts (that awareness is crucial), we can shift our focus into our heart centre. This helps us to move from the fearful thoughts, into the present, while activating the power of our heart’s energy, and the energy of love. When you’re fully present and connecting with your heart, the fearful thoughts aren’t there. In this place, you can connect with what is TRUE. I call this practice Heart-Centred Awareness. Be aware that because your mind can be obsessed with the stories we tell (it’s just trying to keep us safe, albeit from a fearful state), we need to detach from the thoughts and be willing to connect with truth and love, that’s accessed by being present and heart-centred. We can then see things “through the eyes of love”. You’ll realise that despite all the thoughts you were thinking, everything is okay. From there, you can choose what action (if any) you want to take. Believing the fearful thoughts and stories causes suffering. Even if uncomfortable emotion is stirred up from that fearful thinking, bring love and presence to that emotion. Let this be your mantra, “Out of my head and into my heart.” Say it, and do it as often as you can! Remember to subscribe to my channel so you won’t miss more helpful videos to help you tap into your inner peace and happiness, no matter what’s going on around you!